RELEASE 7.1 OF DYNATUNE RIDE & HANDLING. RELEASE 7.1 of DYNATUNE RIDE & HANDLING has been focused on incorporating the most commonly asked Functionality Improvements from the User Community and on adding more Technical Content in order to Enhance the Model Capabilities in specific area's. The Table below summarizes the most important New Features in DYNATUNE RIDE & HANDLING RELEASE 7.1. All New Features are ONLY in PRO & EXPERT Version, since development on BASE & LIGHT Version has ended. Additional Tire Parameters, Extended Suspension Load Deflection Parameters and Steering Characteristics allow more detailed Steering Wheel Angle analysis and more accurate Performance Trade Off Studies. Suspension Toe, Camber & Aligning Torque Compliance Characteristics do now play an even more important role and affect more directly the maximum Tire Performance under Braking and Cornering. Besides these purely Technical Enhancements a new "Constant Radius Test" Procedure has been implemented and Kinematic Suspension Data created in DYNATUNE SUSPENSION DESIGN MODULE can now directly be imported into DYNATUNE RIDE & HANDLING SETUP TOOL. 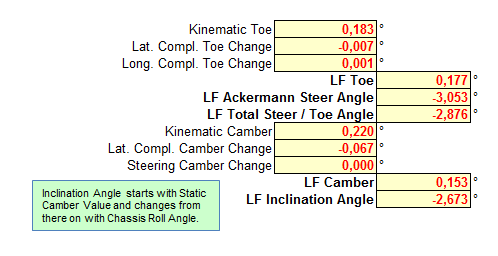 In order to consider more details of the effect of the steering system on the vehicle lateral g performance a basic Ackermann Steering System has been implemented into the 6 DOF Vehicle Model allowing the model to predict more accurately the correct Steering Wheel Angle. Also the effect of Camber Gain changes with Steer Angle (due to Caster and King Pin Angle) is now considered by a Suspension Parameter and permits to simulate better the consequences of additional Camber Thrust on Lateral Vehicle Performance & Balance. Extended Suspension NON-LINEARITY with Rebound-Stop permits enhanced flexibility in customizing Vehicle Setups. 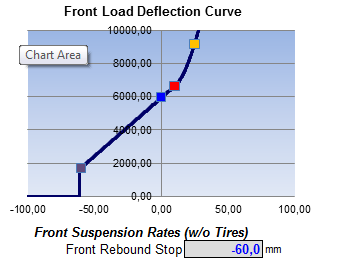 Differentiated Front & Rear Tire Grip Levels permit total freedom of Tire Choice on the Model and an additional new Tire Performance Parameter allows to consider the important effect of Camber (Inclination) Angle on the Longitudinal Grip Level of the Tire. This Characteristic is of particular interest for High Performance Tires in "Camber vs. Traction" Trade Off Studies in Lap Time Simulation. In DYNATUNE the Suspension Compliance Characteristics are considered via the BUNDORF THEORY into the LINEAR Range of Vehicle Dynamics and extrapolated via his US/OS Budget (Gradient) assumptions into the NON-LINEAR Range. In RELEASE 7.1 the BUNDORF THEORY has been been fully integrated into the NON-LINEAR Range and does therefor directly affect the Maximum Lateral and Longitudinal Performance of the Tire and Vehicle. On top of that the experienced user may select to port all Suspension Compliance Interactions directly into the Enhanced Tire Model for achieving maximum accuracy at the very highest lateral acceleration levels. 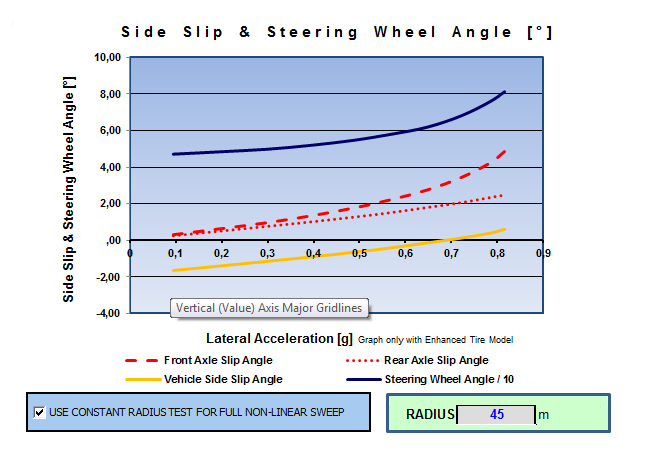 These Model Enhancements permit to directly evaluate the effects of all Suspension Compliance Characteristics on Maximum Cornering Capability, a Unique and New Opportunity for Optimizing Vehicle Stability AND Vehicle Cornering Performance which can usually be found only in very complex Multi-Body Mechanical Systems Analysis Tools with specialist Tire Models. Several Calculation Procedures have been revised and adapted to the new model features whilst focusing on User Interface Comfort as well as on reducing Calculation Time wherever possible. The most important New Calculation Procedure is the "Constant Radius Sweep" Test which allows a similar 10 Step Full Lateral Acceleration Analysis as the "Constant Velocity Sweep" but for a Fixed Radius (and Increasing Speed) and not a Fixed Speed (and Decreasing Radius). This Test Procedure is also one of the most commonly used Objective Real Life Measurement Procedures in the Automotive Industry. Racers can use this Procedure for Optimize their Setup for a Specific Corner Apex. The "Specific" Calculation Test Procedure has been modified to be a "Mini Full Lateral Acceleration Sweep" Test in order to achieve the requested Vehicle Lateral and/or Longitudinal Acceleration Condition in just "One Single Iteration Loop". Beyond that the 3D Performance Envelope Calculation Procedure is now up to 3.5 Times Faster due to a new Reduced Point Fitting Algorithm at a marginal cost for Accuracy. This significant improvement of Calculation Times allows especially those who work a lot with Lap Time Optimization to do more Analysis. 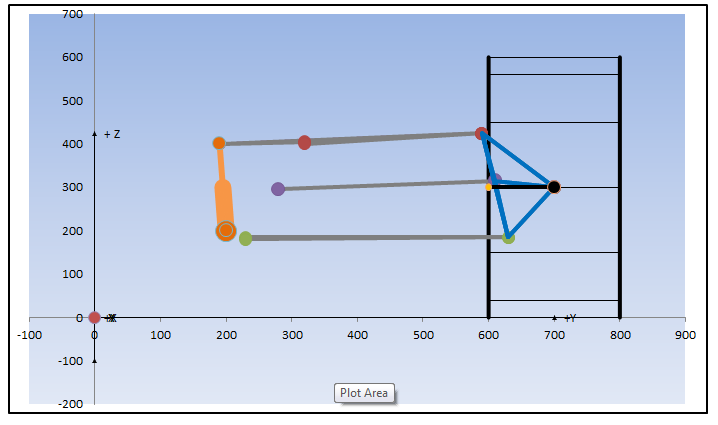 The slower but more accurate up to RELEASE 7.0 used Calculation Procedure will however remain available as a user selection-able option, allowing a full calculation of each Grid Point. For increased User Convenience and Data Exchange Possibilities some New Data Management Procedures have been implemented. In RELEASE 7.1 one can import directly the relevant Kinematic Suspension Data created by DYNATUNE SUSPENSION DESIGN MODULE into DYNATUNE RIDE & HANDLING, both for Front as for Rear Suspension. This enables a very quick and convenient way of incorporating the key Kinematic Output Data from a Suspension Analysis in DYNATUNE SDM directly into the corresponding cells on the various sheets of DYNATUNE R&H. Besides these two New Procedures, one can also from the Master Dashboard "Directly" Export or Import the Actual Model Data into an External Excel Sheet, respectively Load Data into the Current Model without going though the "Set Reference Data" Procedure and "Export" Procedure on the "Results" Sheet. RELEASE 7.1 OF DYNATUNE SUSPENSION DESIGN MODULE. RELEASE 7.1 of DYNATUNE SUSPENSION DESIGN MODULE has been almost entirely focused on incorporating the most commonly requested User Interface Enhancements from the User Community. The Table below summarizes the most important New Features in DYNATUNE SUSPENSION DESIGN MODULE RELEASE 7.1. Both the "Base" as "Race" Version of DYNATUNE SUSPENSION DESIGN MODULE RELEASE 7.1 come with Example Templates for the 3 Standard Suspension Architectures. The "Base" Version has inherited from the "Race" Version the Possibility of Hiding/Showing the various Standard Post Processing Graphs. An additional Steering Rack Parameter permits to calculate the Overall Steering Ratio. Furthermore Specific Data Export Procedures to External Sheets or for creating a Specific DYNATUNE RIDE & HANDLING Suspension Data Input Set have been developed. Both "Base" and the "Race" Version come with a new USER TOOL that permits easy Conversion of Suspension Anti-Angles into Vehicle Percentage Anti-Lift & Anti-Dive. All Versions come with a Standard Example Template for a Generic 5-Link Suspension, a McPherson Strut Suspension and an Integral Link Suspension. The "Base" Version comes in RELEASE 7.1 with the Feature to Hide / Unhide the Standard Post Processing Graphs for Jounce and Steering on the Master Control Sheet. 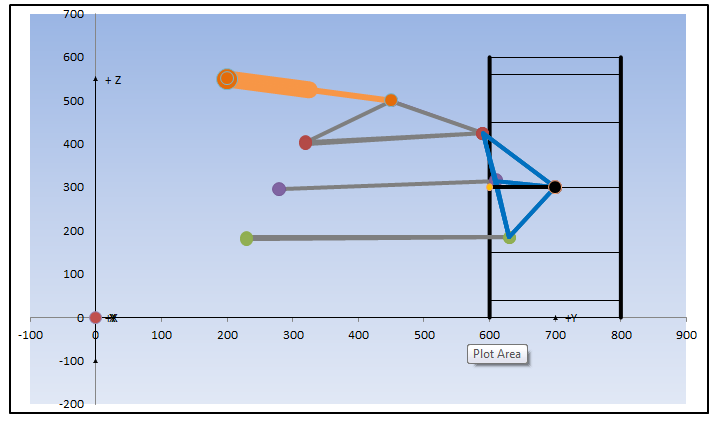 In both "Base" as "Race" Version the RESULTS Sheet can be exported to an External Workbook for external elaboration or usage in alternative Simulation Tools. With the newly added Parameter "Steering Rack Ratio" both "Base" and "Race" Version can calculate in RELEASE 7.1 the "Overall Steering Ratio" of the Suspension. 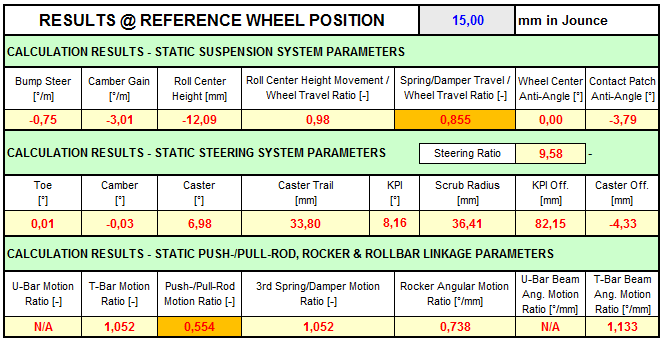 In addition to the "Base" Version, the "Race" Version provides the possibility to look up the tabular RESULTS for Jounce Motion at any desired Reference Wheel Position. As per request of many enthusiast of Historic Race Cars, in Release 7.1 both the "Base" as "Race" Version have been upgraded to allow the correct simulation of famous historic race car spring/damper leverage designs that were used for many years in Formula 1 and even nowadays in some modern sports cars. In RELEASE 7.1 of DYNATUNE SUSPENSION DESIGN MODULE one can next to the already existing Geometry Import & Export Features create a Specific Exchange File containing all the Relevant Kinematic Data of Front & Rear Suspension as Input for DYNATUNE RIDE & HANDLING, allowing a quick and error free transfer of data. In the "Race" Version the Exchange File can be created at any Reference Wheel Position simulating settings at various Riding Heights. Both DYNATUNE SUSPENSION DESIGN MODULE Variants come with a new USER TOOL, that allows easy conversion of Suspension Anti-Angles into more commonly used Vehicle Percentage Anti's. The User can decide to use it as a Generic Standalone Tool (and enter all necessary data) or use the Calculated Suspension Characteristics from the Geometry Section as Reference Input Parameters. Fully flexible.